Falling demand for UK-made goods and a drop in output has caused the sharpest single-quarter fall in manufacturing confidence in 28 years, a survey says. The CBI survey found only 4% of firms surveyed were more optimistic than three months earlier, against 64% who were less optimistic. It also found that in the past three months, 16% of firms had seen orders rise, but 46% said they had fallen. The outlook for the economy has been hit by the global financial crisis. 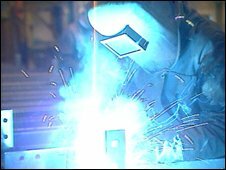 Orders for UK-made goods had declined at their fastest rate since 1999 as domestic demand fell, the CBI's Industrial Trends survey found. The credit squeeze is also having a considerable effect on the prospects for manufacturers' businesses as they encounter greater lending problems. Many firms are planning to reduce spending on machinery and buildings over the next year and the number looking to cut back is the highest since the early 1980s. Some 9% said output was likely to be limited by credit or finance difficulties in the coming three months. The government announced a new £350m aid package for small and medium-sized businesses on Tuesday. "We want to help smaller businesses to plan for the difficult times ahead," Business Secretary Peter Mandelson told the House of Commons business select committee on Tuesday. The announcement was welcomed by various business bodies, including the Federation of Small Businesses (FSB). "These are very difficult times for small businesses and some are running out of the savings they have been dipping in to," said the FSB's head of public affairs, Stephen Alambritis. "We need as much help for small businesses as possible. It's also very important the measures are introduced as soon as possible and that banks release money to small businesses," he added. Meanwhile, manufacturers' association EEF said it welcomed the announcement, but urged the government to go further in the forthcoming pre-Budget statement and make proposals to maintain cashflow and investment. "[The] government clearly understands the pressures companies are under and and this is a useful first building block," said EEF Chairman Martin Temple. "However, we need to build on this urgently with measures to assist companies with their cashflow and ensure responsible lending together with a delay in the planned increases in taxation and new regulatory measures." The need for action was echoed by by Russell Luckock, chairman of metal components manufacturer AE Harris. He would like to see the government provide more detailed plans of the aid package, such as how exactly it will be implemented and how long it will take. "If [the government] postpone[s] VAT for sixth months, that would be helpful, but [the proposals] don't say that," he said. "I don't place a lot of trust in what politicians say - at the end of the day, it's what actually happens." But Mr Mandelson's aid package may go some way to helping businesses across the UK, of which a number expect to make job cuts. In total, the CBI predicts 23,000 manufacturing jobs will be shed in the third quarter and that this number will increase to 42,000 in the fourth quarter. Meanwhile, firms' perceptions of their total order book levels deteriorated over the quarter to their lowest point since 2003. "This survey was conducted during a period of exceptional economic turbulence, so it is unsurprising that confidence has taken such a hit," said Ian McCafferty, the CBI's chief economic adviser. "However, the sharp falls in orders and output show that the slowdown in the UK economy is now spreading to sectors previously resilient to the weakness in the banking and housing markets. "It is also of serious concern that constraints on capital now appear to be affecting manufacturers, in a way that had not been the case earlier." He said that he hoped the recapitalisation of banks and the recent cut in interest rates would prevent a further credit squeeze over the winter. The muted results will do little to cheer those who are predicting similarly downbeat results from new GDP figures, to be released on Friday. If, as several experts expect, UK GDP contracts, it will be the first decline in 64 consecutive quarters and the first time the UK has slid into negative territory for 16 years. This will stoke further fears that the UK is heading towards a recession. "The sharp manufacturing downturn and substantially reduced price pressures evident in the CBI survey heightens the case for the Bank of England to cut interest rates aggressively again in November," said Howard Archer, economist at Global Insight. The Bank of England cut rates earlier than was expected this month, together with several other central banks across the world, including the US Federal Reserve.